If you’re stumped about what to get your 1-year-old boy for Christmas, I get it. They’re not exactly big enough to write a letter to Santa or tell you what they want. Luckily, there’s a universal list of things that all young toddlers tend to enjoy and lots of new gadgets your child will need as he’s leaving the baby phase of life. I came up with a list of 30 things that would be perfect for a 1-year-old’s stocking this holiday season. Christmas with a 1-year-old is so much fun! We know you’ll love seeing his eyes light up on Christmas morning when he sees all the gifts under the tree and senses the excitement from his family and friends. Happy Shopping and Merry Christmas from Mommy High Five! Something that will keep his attention. Your little guy is likely wiggly and moving all over. You want something he can sit down and enjoy (at least for a few minutes). A gift that will help him learn. At this stage, a child is learning so quickly. Look for a stocking stuffer that will challenge his ever-expanding brain. One that will be used for a long time. You’ll feel better about giving a gift your boy can use until he is an 18-month-old or even much longer. 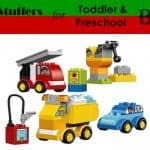 A gift that is high quality and engaging can last until he is preschool age and even be shared with younger siblings. A variety of gifts that engage his different senses. Your toddler is learning about the world around him, and there is no better way than using his senses to learn. So, look for a combination of gifts that he can see, touch, taste, smell, and hear. It’s so much fun to hear your little boy start to communicate, and reading him board books will help him learn lots of new words. 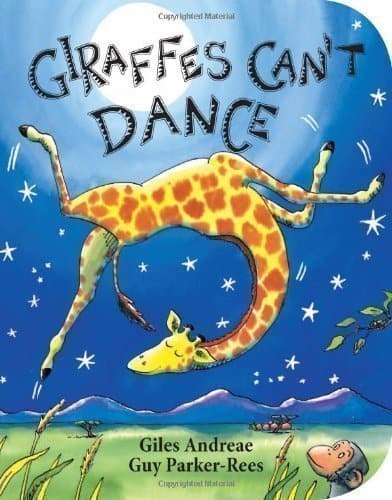 This cute book is a best-seller, and its fun rhymes and bright colors will leave your toddler asking to read it over and over again. 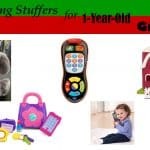 If your baby is starting to take an interest in TV, you might consider including a DVD in his stocking. 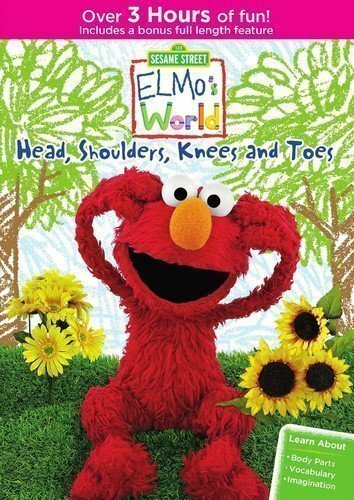 I highly recommend Elmo’s World! It’s the part of Sesame Street that babies are most excited by, and it’s educational. This DVD focuses on teaching your child different parts of the body. There’s something about bags and backpacks (and dinosaurs!) that make toddlers excited, and your little man will be thrilled to get one on Christmas morning. 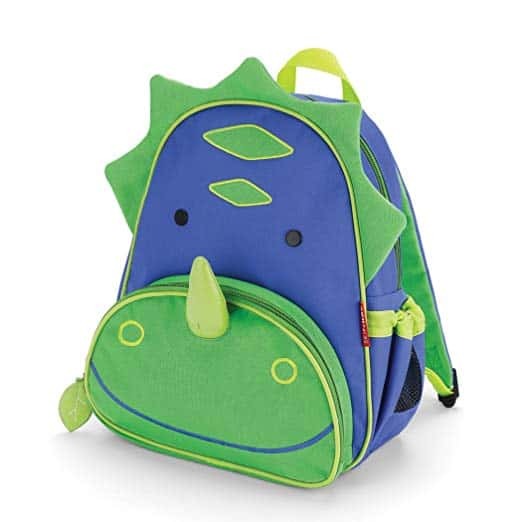 This cute and durable backpack comes in three different designs: a dinosaur, a shark, and an upside-down bat. 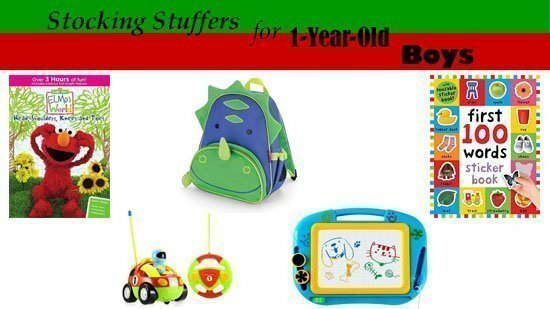 Your little one will love carrying around all his toys in this backpack. As your child gets more independent, he’ll need some new gear. If you haven’t tried Munchkin Miracle 360 cups, you’re missing out. 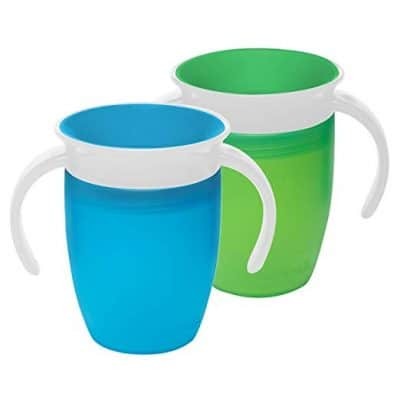 These sippy cups are easy to clean, rarely spill, and are good for your little one’s oral development. Plus, they’re the perfect size for a stocking! Sometimes the best presents for 1-year-olds are the simplest ones. There’s a reason doctors’ offices give out stickers… little kids love them! 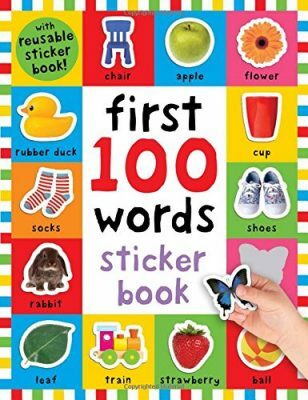 These stickers are geared toward toddlers, and their bright, fun words and pictures can help teach your child new words. 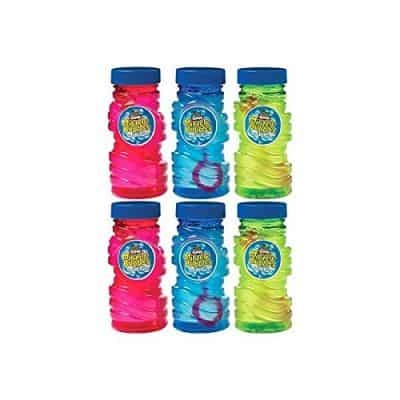 Bubbles are another simple, inexpensive, and fun gift for your 1-year-old. He will love the magic of bubbles, and it’s a great interactive toy. You can buy this multi-pack and save some for Easter and Birthdays! 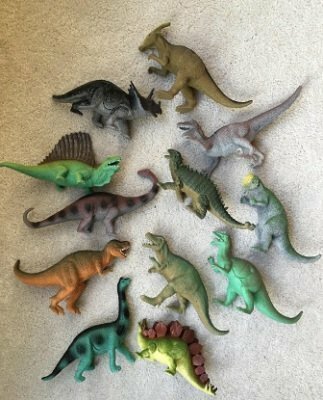 So many toddler boys love dinosaurs, and these toys are a great choice. You can wrap these dinosaur action figures individually in his stocking and he’ll have a ball opening them and saying, “Rawr! !” Each dinosaur is printed with the name on its belly so you don’t have to be an expert to teach the names to your son. 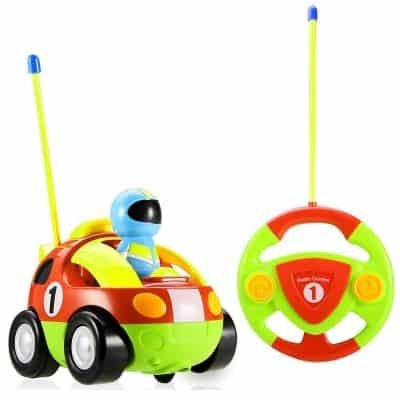 This tiny remote control car may be a little tricky for your 1-year-old boy to drive on his own right now, but he’ll have a blast chasing it while his daddy drives it around. It plays music, is a perfect toddler introduction to remote control toys, and it’ll be fun for the whole family! You will be surprised at how quickly your little guy learns to drive it. Toddlers love soft, cuddly stuffed animals. This sweet lion is so cute and comfy. 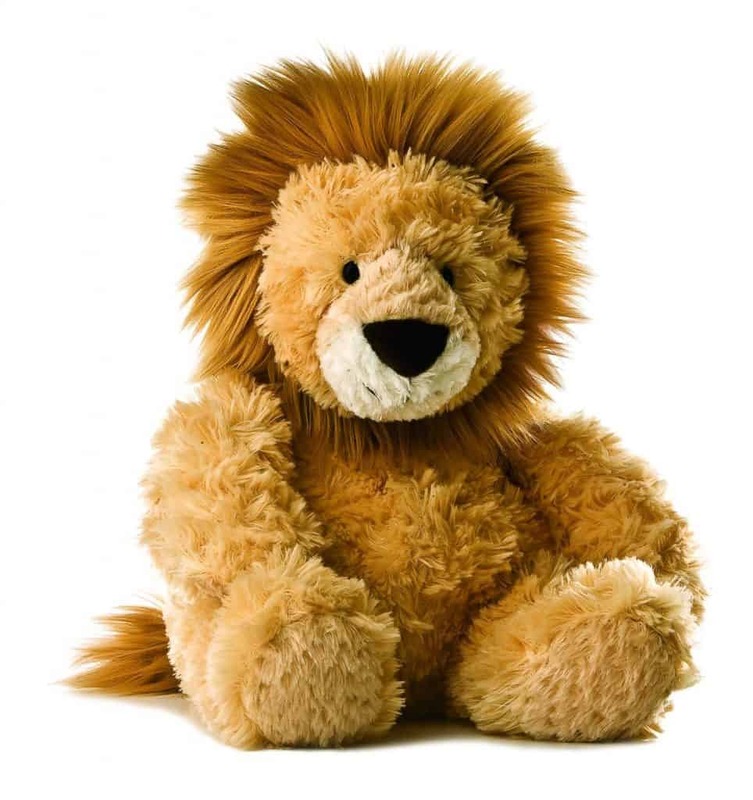 It is perfect to use as a pillow, but it also has bean bag filling that helps the lion sit up on its own. It’s a high quality stuffed friend your boy will love. What kid doesn’t love fruit snacks? 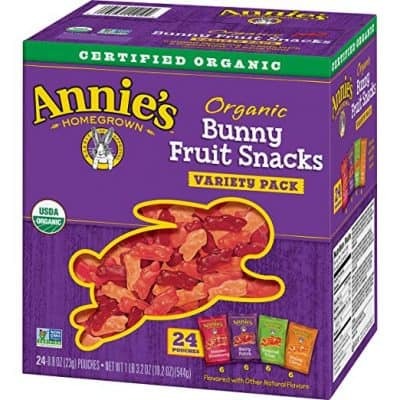 These snacks are organic and are made with no artificial colors, flavors, or preservatives. Your boy will love the fun bunny shapes and the great flavor. Add a few pouches to his stocking and save the rest for later! I’ve noticed that 1-year-olds tend to get interested in what their parents are doing, and that means they start to enjoy playing pretend. Play food is perfect because your toddler can “cook” and “taste” his foods while you’re making dinner. 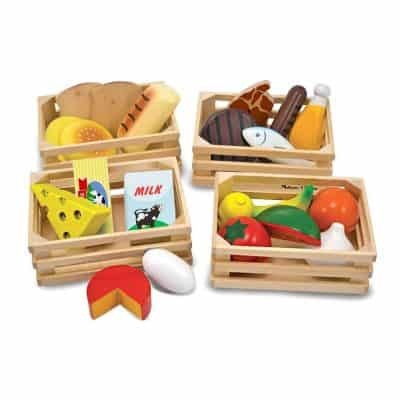 These natural wood Melissa & Doug baskets of food are both adorable and functional. When I was growing up, Santa always brought me a toothbrush for Christmas. Even though it was expected, it was still fun — if only because there was one extra gift to open. 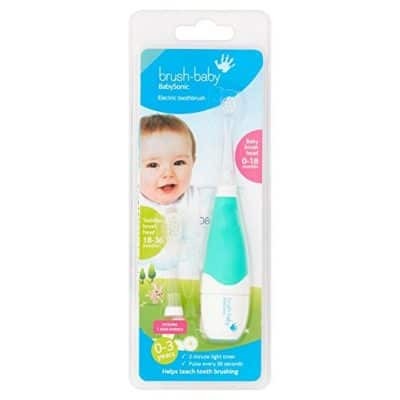 This electric tiny electric toothbrush is something your baby needs and something he’ll have fun with… it might even make him excited to brush his teeth! 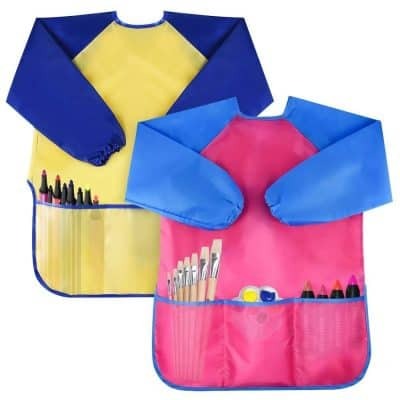 If you’re traveling for Christmas, I’d highly recommend you consider this drawing board. It’s a perfect, mess-free gift that encourages quiet play in the car or at church. Plus, they’re inexpensive. Win-win. 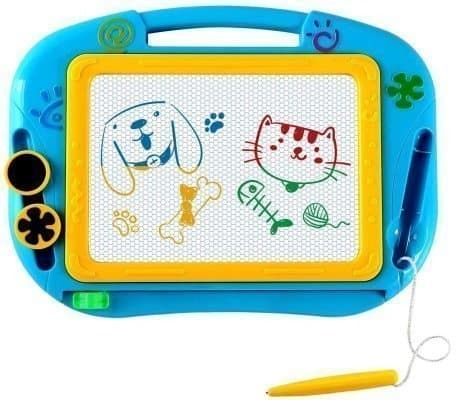 If he hasn’t already, your one-year-old will soon be learning how to scribble. 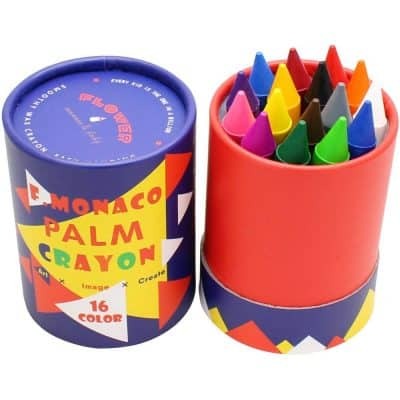 These crayons are thick and sturdy so they won’t break or snap while a child is learning to color. And they’re the perfect size to fit in a stocking. 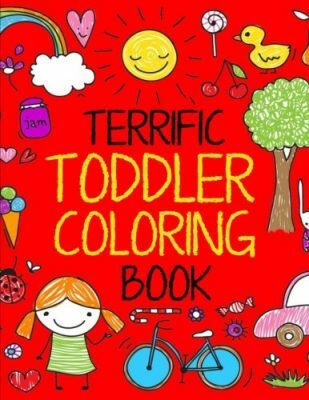 This coloring book designed for toddlers is full of fun pictures that your child can point at and name as he scribbles on them. It would pair perfectly with those chunky crayons, and it’ll help him improve his fine motor skills this year. 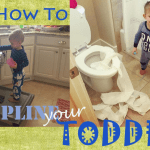 Some toddlers start to express an interest in potty training between 18-24 months. If your toddler has expressed an interest in potty training or you think you’d like to give it a try, you might consider getting him some big boy pants. The underwear linked above are superhero underwear and might make your little guy excited to start training! Your little guy might not know what it is when he opens it, but if you put bubble bath in his stocking it will soon become one of his favorite presents. 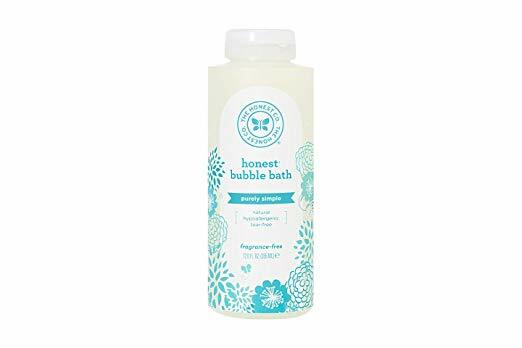 This Honest Company bubble bath is sourced from plants. It’s hypoallergenic and gentle, which should leave mom with some peace of mind. 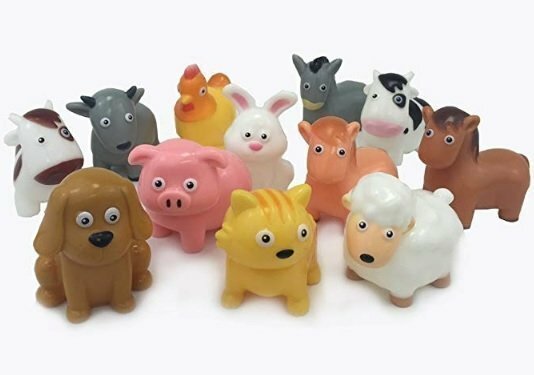 If your toddler is more interested in farm animals than dinosaurs, these chunky three-inch farm toys would make a perfect stocking stuffer. They’re easy for toddlers to hold and aren’t heavy, so they won’t hurt if they’re dropped or thrown. Some kids tend to get nervous at the doctor’s office, which is why a play medical kit is a great toy. If your little one gets familiar with the doctor’s tools, it may be less scary. 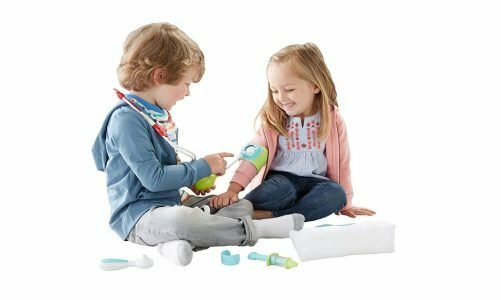 These toddler-sized medical toys will lead to hours of imaginative fun. At age one, this one will definitely need some adult supervision. 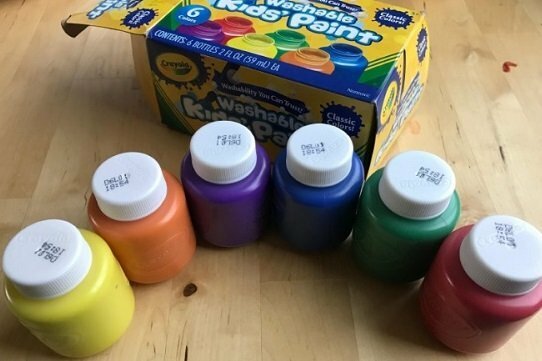 Aren’t these little bottles of finger paint adorable? Pull them out on Christmas day, strip him down to his diaper, and let him go crazy painting you an adorable picture… then give him a bath! If you’re not crazy about the idea of stripping your toddler down to his diaper to let him finger paint, you might consider getting him this cute art apron. It’ll cover his arms and body and it’ll protect him from the mess. It’s also big enough that your little artist can use it for years to come. 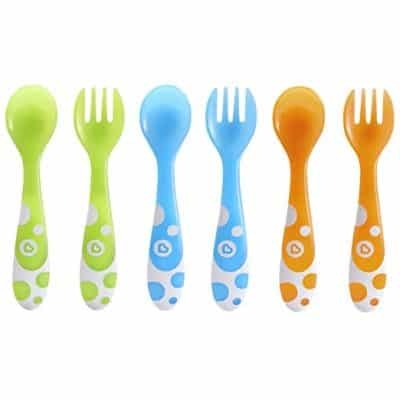 If your child doesn’t already have some toddler utensils, consider this set of Munchkin utensils. Age one is when children start to learn to use them, so having some that are his size will help him become more confident in his self-feeding abilities. I can’t think of a single little one-year-old boy who wouldn’t be excited to get a ball in his stocking. 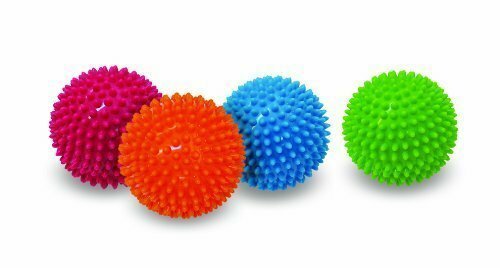 These sensory balls will fit in a stocking and are the perfect size for indoor play. They are colorful and fun. Call me old-fashioned, but I think every child needs a rubber duck. 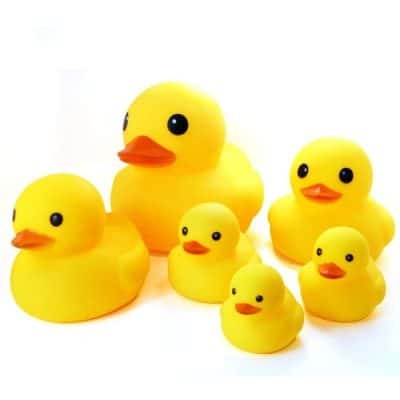 Actually, I think every kid needs this little family of rubber ducks. Imagine the hours of bath play with a mommy, daddy and baby ducks! These are absolutely going into my toddler’s stocking this year. Silicone bibs are amazing. They have a large, gaping pocket to catch dropped food and they wash off easily in the dishwasher. If your toddler has never used a silicone bib before, you’re in for a treat because it makes meal time so much cleaner! Merry Christmas to mom and dad. Kids seem to be born with an interest in electronic devices. 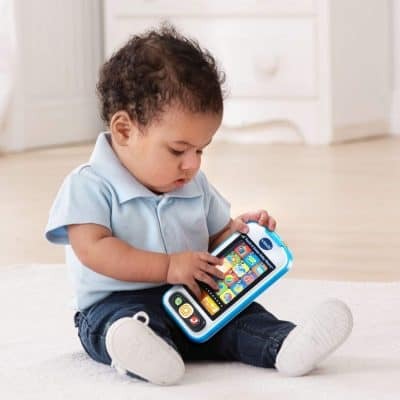 Your 18-month-old will be excited to get a phone of his very own. This play phone will give him the opportunity to “text” his friends. It has a touch screen and realistic apps, so he may not be so inclined to steal yours all the time. 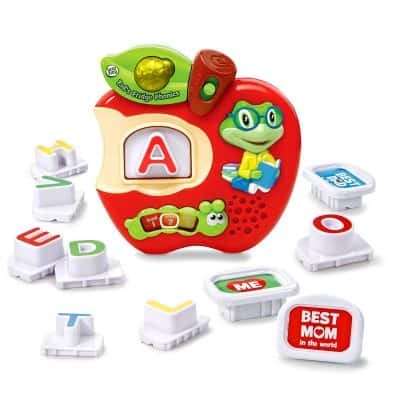 This magnetic letter fridge set sings the alphabet and will tell your child what sounds the letters of the alphabet make. It’s a great educational toy, and it’ll keep your little guy busy for a minute while you get something done. These tiny bow ties will make your toddler look like a little stud during his second year of life! 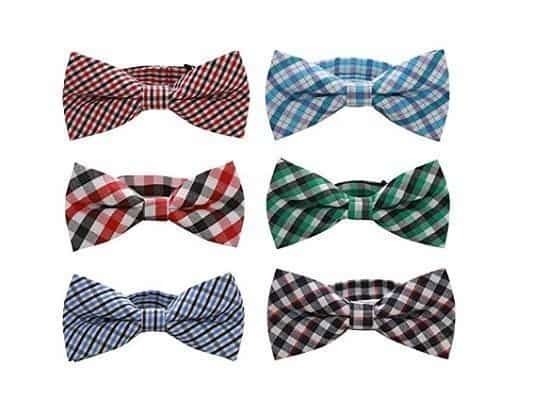 They’re inexpensive and their pre-tied bow makes them easy to put on and take off. He can wear them to your Christmas church service! If your 1-year-old doesn’t have trucks in his toy bin, now’s a good time to consider getting some. These push & play trucks are friction powdered, which means they drive forward after your little one pulls them back. 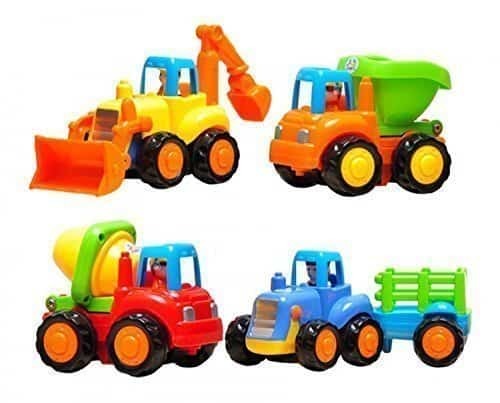 They also have fun moveable parts, like diggers, dumpers, and trailers. For another fun sensory activity to do on Christmas, include some Play-Doh in your child’s stocking. 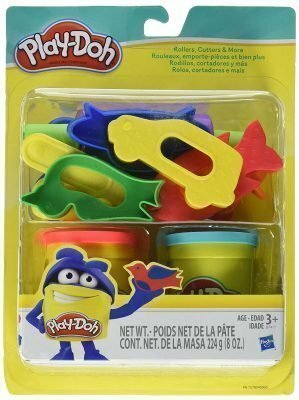 I like this set because it’s small enough to fit in a stocking, but it comes with several fun molding tools that he can use over and over again when you buy him more Play-Doh in the future. There are so many fun options for stocking stuffers, but it’s also important to remember that stockings are… well, small! I’ll definitely be including the rubber ducks, Play-Doh, a treat, and the electric toothbrush in my one-year-old’s stocking this year… but I may wrap a few others and stick them under the tree. Which ones would you choose? Do you have any fun ideas or family traditions to add to the list?